This unique photo mug is a Seabee Museum and Memorial Park exclusive. This beautiful dishwasker safe mug features full-color photos taken on the museum's grounds. Our signature FULL COLOR mug is made exclusovely for us. Wrapping around the mug are five color photos taken at the Seabee Museum and Memorial Park. 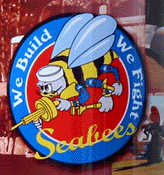 On one side is a colorful FIGHTING BEE in striking full color ... We Build, We Fight ... Seabees! This mug is just $7.